The top picture was taken from an upstairs window of one of the Crown Square shops. The local council still maintains the immaculate formal gardens and carefully trimmed hedges in this section of the park (see bottom image). But in 1951-2, when this image was most likely taken, the Hall Leys had been refurbished. In the summer of 1950 there had been a very critical Council meeting when the Finance Committee met to discuss the park's takings. Councillors commented on the state of the tennis courts, the miniature golf greens and the bowling greens. Their condition was described by some members as deplorable. Councillor Beddington observed that in post war Britain money was not so plentiful and, of course, rationing did not end until 1954 as certain things were scarce. Whilst Cllr. Eldridge felt that no piece of park in the country was more overworked than the Hall Leys as it was open for seven days each week another councillor, E. C. P. Stevens, noted that they would be committed to heavy expenditure before the end of the year. The photograph below, taken probably at the end of the Second World War, tells a slightly different story as the beds, hedges and plant containers do not look as well cared for. The park from Crown Square. No date, but probably late 1940s. Some of the people seated and facing Crown Square could have been waiting for the bus. Note the female bottom left is wearing the uniform of the ATS. 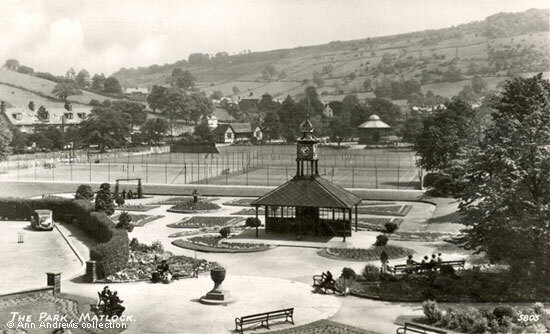 During the War, in July 1943, the Derbyshire Times reported on the general dissatisfaction about the fate of railings that had been both in the park and around the town. Several months before, these railings had been removed to meet what was supposedly an urgent demand for scrap metal by the Ministry of Works. Unfortunately, they were then dumped in a scrap iron yard on Bakewell Road and left for all to see. Nothing was done and the railings were allowed to rust. It was pointed out that whilst the Council and the home owners had been willing to help, the railings were not given to the nation to create an eye-sore. See: Flooding in the Matlocks - scroll down to the last group of pictures. After the War there was a need to get the town's tourism up and running. A Guide book from around 1950 described the park. "We are soon in Matlock [from Matlock Bath], and crossing the river we see ... on our right the Hall Leys. Beautifully laid out, the Hall Leys, which is only one of the many public parks, has much to offer the visitor ; a boulevard runs along the river band to a footbridge leading to Pic Tor. ... On the Hall Leys are facilities for tennis, bowls, bunker and scenic golf, besides scoota boats on the boating lake, and a miniature railway. A paddling pool, swings and see-saws are provided for the children". Summer 2013. The former tram shelter and gardens. 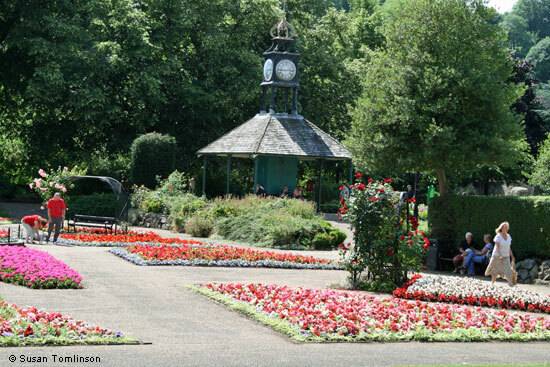 The Hall Leys park still provides many activities for the town's visitors. 1. 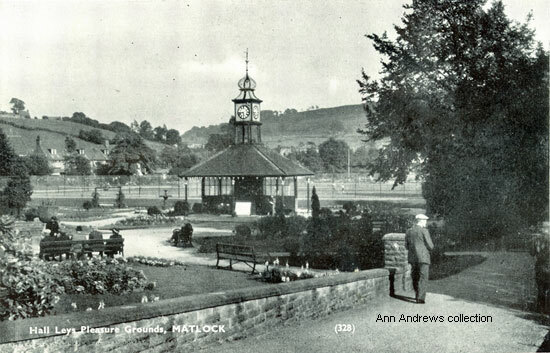 Top postcard of "The Park, Matlock" The Seal of Artistic Excellence Series, published by the R-R-(Postcards) Ltd., London E. C. 4. Posted in Matlock, May 1952. © Ann Andrews collection. 2. 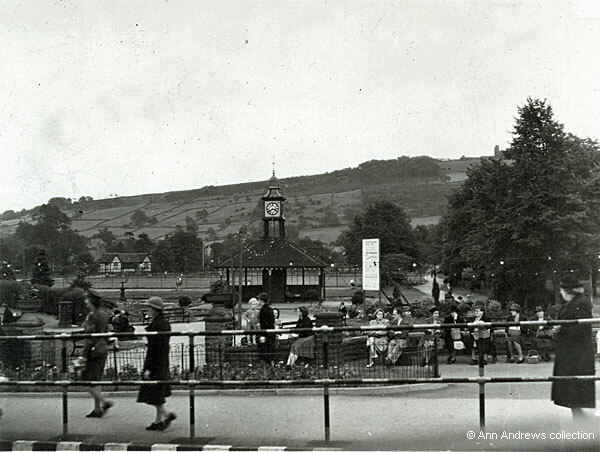 Photograph of the park from Crown Square, no date, © Ann Andrews collection. 3. From Simpsons' "Derbyshire Beauty Spots, No 2, Matlock area", published as a small booklet. Photo: Simpsons the Printers (no.328). Ann Andrews collection. Published with the kind permission of Michael Simpson on behalf of the Simpson family. 4. Photograph © Susan Tomlinson. "Derby Daily Telegraph", 19 July 1950. "Derbyshire Times", 23 July 1943. "The Matlocks, Derbyshire", published about 1950 and printed by Geo. Hodgkinson, Printer, Matlock.